"As above, so below. As without, so within." Casually I wondered this morning how this pose would tie into my day. 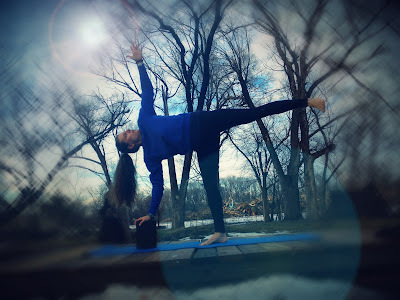 I wondered what I would write about, what I would feel in regards to this pose, Ardha Chandrasana or Half Moon pose, and how it would be relevant. This weeks theme or intention is all about hip openers and the hips are where we store emotional stress so for me hip openers seem like playing with fire in a sense. Great if you are cold but dangerous for someone who is afraid of change and that is someone I am trying not to be. I embrace change and growth however not without a fair amount of work. Most times the work is done in the midst of stress and hardship. This morning a HUGE stressor came about. It affects the whole family as its of the financial sort. Its not catastrophic but stressful none the less. After talking with the superhero and forming a plan we decided that its a good time to try some projects that we have had on the back burner. So what was a huge stressor is now a HUGE motivator to do things differently and try new things! These projects, one in particular, is something I have really really wanted to do for a couple of years but it just wasn't the right circumstances but now it turns out that out of the darkness comes the light. One cannot have light without said darkness. From this huge stressor comes opportunity and joy just thinking and imagining! The hip opener work I have done recently freed up parts of me that were previously preoccupied with other pent up stressors. I feel looser and lighter these days and more able to handle what comes my way instead of my proverbial cup always about to overflow. So today when this stressor came about I was able to handle it creatively and calmly instead of in a panic because I just didn't have any reserves to deal with more. The myth behind the asana of Half Moon Pose is about Ganesha and Chandra. There are several different versions but this is the one that Nichole from Humble Beginnings Yoga posted today to instagram. It goes like this..
Ganesha was walking along a path stuffing his mouth with cakes. Suddenly a cobra popped out of nowhere and startled Ganesha. He fell off his mouse and his belly ripped open. All of his cakes flew everywhere. Chandra having seen this began to laugh at Ganesha. Full of rage (he is Shivas son), Ganesha broke off his right tusk and hurled it at the moon. Pierced by the turk, Chandra's light went out. Ganesha cursed the moon and the earth was continually lit by sunlight. With no night, no dawn, no dusk, balance was lost to the world. The earth became scorched and hopeless. Men and gods alike pleaded to Ganesha to allow the moon to shine one more. Flattered, he agreed to a compromise. He would allow Chandra to shine, but she was required to wax and wane, only shining at her full potential once every four weeks. This would be her permanent lesson for laughing at him. However, Ganesha always carries his broken tusk to signify his momentary rage at having lost his balance. Moral: The sun and moon are opposites. We strive to seek balance between both sources of light. Without the moon, there is no softness, no shadow, and ho halfway point between our days. The darkness is as equally important as the light. Its is always both. "as above, so below. As without, so within." So, today I found balance between fear and motivation and stress and excitement. I was quite busy and didn't practice yoga much however I can tell the hip openers are making changes. I felt strong and rooted today in the short practice I did. It was also wonderful to have a reprieve from the cold and be able to practice on my deck in the back. There are upsides to everything. At least if something crappy happens it should happen on a lovely day so I can sit on the deck and think about my next move in the fresh air. Things just don't seem as bad when sitting on the deck. 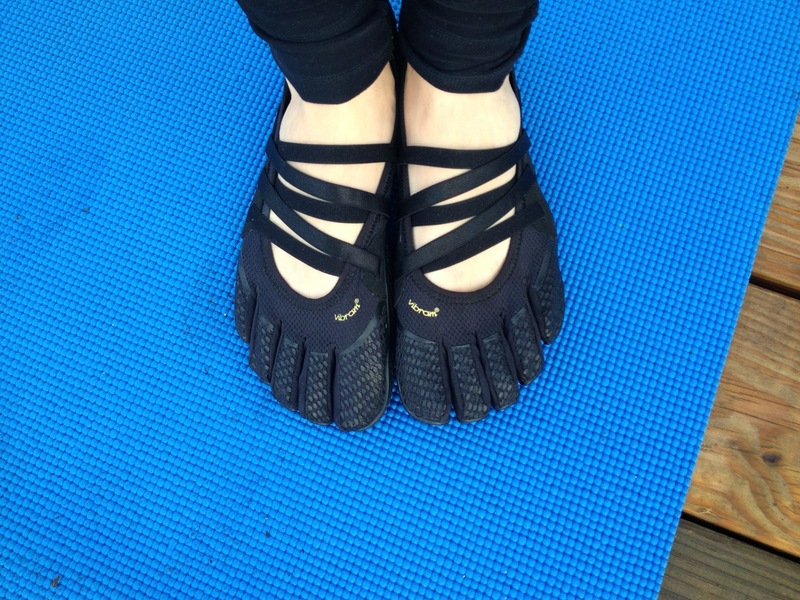 As I was running around busy today, I had the new Vibram Five Finger Alitzas on my feet and I love love love them! They feel like a slipper and are so light! I am thinking that these are now my favorite VFF. In the theme of balance, when you can feel the ground, you have better balance. These shoes let you feel the ground quite well. Full review to come eventually! Very cool vibes I have never seen this style.... They don't make vibes to fit me :( I am in between the large child size and the smallest ladies size. Well that's what the running store here says. Grrrr ! I have a pair that are a litte big so they defeat the purpose of wearing them !! !